If you take a look around, there are many track day providers, riding schools, and instructional programs available for motorcycle riders of all levels. Whether you ride on the street, track, or even dirt, there are plenty to choose from. But what about rider instruction at track days? Sure, there are plenty of instructors available at track days, but you have a larger number of riders and many riders seek personal or even one-on-one coaching. Enter N2’s Advanced Training Program, also known as ATP. In this article, we’ll provide a brief overview of ATP, the concepts behind the program and close with a rider spotlight featuring one of our students. Before we go further, let’s take a step back and explore the concept behind ATP and the teaching methods at its core. Long before N2 was even a sketch on the drawing board, we have been longtime fans of YCRS (Yamaha Champions Riding School) and feel it is simply the best rider training available. Why? It works. These training methods are based on simple and solid principles, easily grasped by even the newest of riders. Nick Ienatsch, lead instructor and founder of YCRS, has thought long and hard about ways to bring his teaching methods to other rider schools and programs like ATP. What I find most impressive about YCRS is their uncanny ability to boil down even the most complex topics and present them in a succinct and easy to understand manner, ultimately bringing riders to that “ah ha” moment in very short order. ATP is not designed to replace YCRS. Rather, it is a subset of their school and serves as a primer towards their full two-day camp. In the end, our students learn these riding techniques at a more rapid pace and find themselves riding faster, safer, and using less effort than they had ever imagined. While it’s no secret that many of N2’s instructors are graduates of YCRS, the ATP instructors further their education and teaching methods through a collaboration of a newly developed YCRS program known as the Champions Certified Coach – or 3C for short. OK, so how does this work? In a few words, ATP provides focused rider training to small groups of riders offered as a one-day school. Rider groups are limited to 3 students, each with a designated ATP instructor throughout the day. Each rider is presented with advanced riding topics explained using simple and easy to understand terms in a classroom setting, reinforced with specialized low-speed drills and on-track instruction. As an ATP student, your day starts with the morning riders meeting. This is where the event director will explain general rules of the track day, passing rules for each group, use of flags displayed by corner workers and much more. They will also highlight the fact that ATP students will be on-track with their instructors all wearing high-viz green vests. We ask riders to make note of the ATP activity and to give students a little extra leeway while on track. Once the riders meeting has concluded, all students are directed to the designated ATP classroom with their instructors. The classroom will be “home base” for the entire day. Be sure to get a good night’s sleep, you’re going to need it! Here, the students meet their instructors and get right down to business. The instructors will discuss each student’s riding and what they need most from the school. Instructors help each student come up with a plan. As class begins, we get right into the meat of the discussion; riding fundamentals. As stated earlier, ATP does not reach deep into ethereal concepts nor fill the room with nonsensical jargon. To the contrary, we will present YCRS’ 100 points of grip and how we trade brake (or throttle) points for lean angle points, braking lighter and longer, and loading the tire before we work the tire. These are all concepts and fundamentals taught as part of the YCRS curriculum. We also work to remove words from our vocabulary like “grab” or “stab” when discussing braking, for example. Smooth is key in this sport, and a topic highly stressed at both ATP and YCRS. In-between each lesson, the students will be on-track where they will engage in lead-follow with their instructors and work on the lesson at hand. Our instructors will observe each student for smoothness, use of the racetrack, body position, position of head and feet, readiness upon corner entry, and smooth application of brakes and throttle. One of the key methods taught by YCRS is the use of a technique known as trail braking (see the full article by Nick at http://n2td.org/trail-braking). Searching online, you will find no shortage of debate surrounding this topic. However, it is our firm belief that riders should be taught this technique from the onset instead of having to unlearn bad habits later on. Our parents [most] -let alone riding schools- teach us to get all of our braking done while straight up and down. As we become more cognizant of the load and forces at work on our front tire, trail braking makes perfect sense, and it’s hard to imagine not using this technique everywhere and always. To familiarize students with the concept, we perform a drill in a designated paddock area where students practice coming to a smooth and controlled stop. Without giving away the whole exercise, each student quickly becomes familiar with the technique in a low-speed and safe environment. I like to call this the “wax on, wax off” that helps to program the “feel” into each student’s DNA. Like all things, a little orientation can go a long way. Throughout the day, each student will continue a cycle of wash, rinse and repeat with their instructors, engage in lead/follow on the racetrack and continue to refine the riding fundamentals taught in the classroom. As an instructor, I am thrilled and amazed at the progress made by each student in a single day. Seeing each student experience that “ah ha” moment is why we do this. So let’s take our featured rider and put him under the spotlight for a moment. Meet Mr. Alex Airhart. Alex is no stranger to motorcycles – he’s been riding most of his life and currently manages Ducati Financial Services at VW Credit, Inc. During the 2015 season, Alex was like most riders in the Novice group; practicing rider fundamentals and making incremental progress with each and every track day. Like many new riders, Alex tended to be more upright on the bike, tense on the handlebars, “crossed-up” in the corners and struggled to be a smoother and more consistent rider. He was sometimes frustrated and wanted to see greater progress in his riding. Eager to push through the learning curve, Alex enrolled in the ATP school with the goal of building a more consistent foundation to improve his riding. After just one day in ATP, his riding changed almost immediately. Let’s take a look at this first picture of Alex at PittRace taken from his track buddy’s onboard camera. Notice that he’s moved out of the seat slightly, but his head remains up over the centerline of the bike, and his body language is decidedly “rigid”. His body and inner leg are “locked” into the bike, restricting movement about the motorcycle. This is typical of newer track riders. 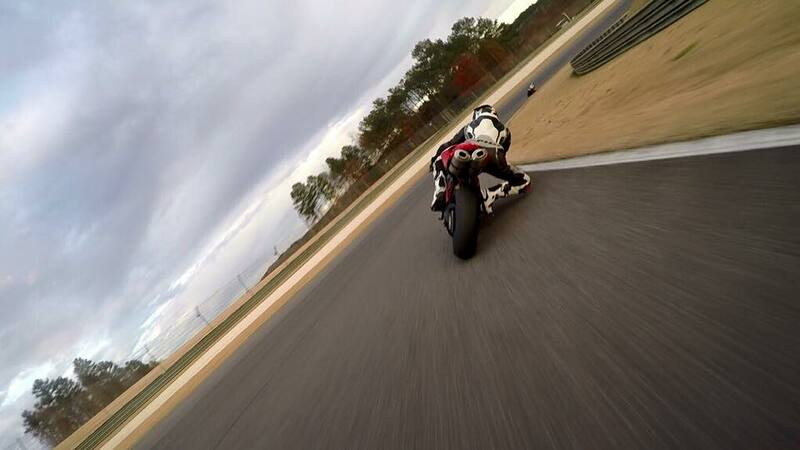 So let’s flash forward a few months, a few more track days… and a bump to the Intermediate group! Here, we find a whole new Alex. Like before, this is a clip taken from onboard video footage from his same riding buddy. Alex in much better form: leading the motorcycle through the corner with his head, his right leg forming the YCRS “triangle of light”, pivots on the ball of his foot using the inside foot-peg, left arm resting on the tank, his body (not excessive) weighting the inside of the motorcycle helping it turn, riding smoothly and -oh yeah- hitting those apexes! Alex’s story is one we hear again and again. No actors, no scripted lines… just a real-world rider realizing the benefits of the what these programs have to offer. So whether you’d like to sip from a teacup with ATP or drink from a fountain with YCRS, these schools have a lot to offer, and your riding will thank you for it.